First line: "My brother Barron sits next to me, sucking the last dregs of milk tea slush noisily through a wide yellow straw." The ending of this epic series was truly amazing! Gifted teen shapeshifter Cassel Sharpe is once again, torn between doing the right thing, or siding with his decidedly shady magically-gifted criminal family. 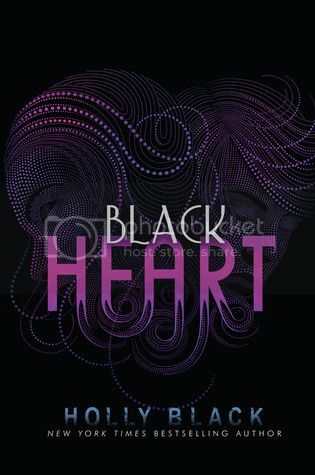 In Black Heart, Cassel has gained fairly good control over his transformation magic but spends a lot of time stressing out over his work as a double-agent. His long-time unrequited love, Lila, has officially joined the magical mafia (with the tattoos to prove it) and in the meantime, he's been offered a very sweet deal with a witness protection program - provided he can deliver a couple of big-time mafiosi hold-outs to justice. Conspiracies and backstabbing abound as criminals and politicians vie for control over the "curseworkers" - the small segment of the population with magical ability who are hated and distrusted by everyone. I love how Cassel really comes into his own in this book. One of the things he says is, "Now I know why people are afraid of transformation workers. Now I know why they want to control me. Now I get it. I can walk into someone's house, kiss their wife, and eat their dinner. I can lift a passport at the airport and twenty minutes later it will seem like it's mine. I can be a blackbird staring in a window. I can be a cat creeping along a ledge. I can do anywhere I want and do the worst things I can imagine, with nothing ever to connect me to those crimes. Today I might look like me, but tomorrow I could look like you. Tomorrow, I could be you. Hell, I'm scared of myself right now." I can't quite decide if this is a "good guys don't always finish last" or an instance where the bad guys win, or a bit of both, since Cassel has always been this fish out of water in his criminal family. I don't want to spoil anything, but I can say, after having been through so much, Cassel finally does get a much deserved respite.